What’s up, Metal maniacs? I’m here once again to give you an insight on this Heavy Metal quintet; hailing from Germany: PARAGON, signed via Remedy Records. This is Metal, people. As soon as I pressed play on my device; I was simply gobsmacked at the sheer prowess of this band’s skill. “Hell Beyond Hell” is an album that will immediately kick you in the balls and make you want to go nuts, absolutely. Energy, power, speed and steel compiled in this Heavy, Thrash, Classic…you name it, Metal destructive force. Right off the bat… I was immediately excited. We have Andreas Babuschkin on vocals, who just has one of the best vocal ranges I’ve ever heard of. I hear Bobby Blitz from OVERKILL; Biff Byford from SAXON, and I’ll be the first to tell you that this is a vocalist who wanted to kick your sorry arse from the beginning. Martin Christian and Jan Bertram on the Heavy Metal guitars unleash an abundance amount of thrashing riffs that explode with rage; skill, and technique. I tell ya, I had my tongue out in an air guitar frenzy. And with Jan Bünning on bass and Sören Teckenburg on drums; I can positively say that this is a Metal band that got me extremely excited to surprisingly be asked to review “Hell Beyond Hell” for this amazing super group. Once in a while I get a band of this magnitude and strength and PARAGON are a simple reason as to why I started journalism in the first place. If all bands sounded like this though; I guess that would be boring, right? HELL NO. To be honest, we need more bands like this, as they transcend the excellence of as to why Heavy Metal should be kept alive and why YOU should support this band, among others of this brilliance. You might think; “he’s just being biased”, I would say to you: “nah, mate. I just know good music when I hear it.” I say things straight from the heart and I genuinely feel that “Hell Beyond Hell” may well could be one of 2016’s album of the year material; in its hall of fame contributes. Right off the bat, “Rising Forces” introduces a sound production that’s suited to this band’s music style; a heavy, pounding fist of steel. Vocals are catchy as Hell; even as I progress with heavy-hitters: “Hypnotized”, the titular track: “Hell Beyond Hell”, “Heart of the Black” are prime examples of why this band got me so excited. PARAGON are the prime definition of excitement in the world of Heavy Metal; from thrashtacular riffs to bloody amazing harmonies of steel, each song provided an enjoyable headbang that could potentially give one whiplash! Even as I near the halfway point of this masterful record, everything so far is just as memorable as any of the Big 4, or any of your favourite band’s material. Proven with its perfect sound production; perfect song-writing, and while originality may be sparse, “Hell Beyond Hell” was made for an enjoyable thrash session from beginning to end. Speaking of sound production; we all love it louder than hell, right? I can’t help but recognize DEATH DEALER’s “Hallowed Ground”-esquire sound production, similar abound in “Hell Beyond Hell”. It’s just a perfect sound for this stature. Anthem-like intrigues nearing the half-way point of the album. …things only get more epic from here on out. Nothing gets old and everything musically just sounds like a fresh, instrumental take on the Heavy Metal genre. “Stand Your Ground”, “Meat Train”, “Buried In Blood” and “Devil’s Waitingroom” comprise in some very unique traits including devilish vocal effects, bashing riffs of steel and just…and just…SUCH HYPE METAL. Simply put; “Hell Beyond Hell” will be a Metal Temple album of the year for me, if it isn’t yours…well then! “Hell Beyond Hell” is a true Heavy Metal album that any Metal fan WILL enjoy. Do yourselves a favour…and check it out, hell, BUY “Hell Beyond Hell” and support this spectacular band! 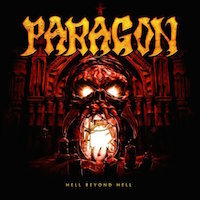 If you love your Heavy Metal Thrashing instruments at an ungodly but ferocious speed; PARAGON are the band for you.